The chip maker has released an Android app that shows how NFC phones can be used in conjunction with its M24LR64 wireless memory chip to interact with a wide range of electronic devices including consumer electronics, smart meters, home appliances and portable healthcare devices. STMicroelectronics has released an Android app and a reference implementation featuring its M24LR64 dual interface EEPROM wireless memory chip, designed to demonstrate how the device can be used as a bridge between electronic items and NFC phones. The new Dual EE app works in conjunction with a temperature logger featuring an ST M24LR64 wireless memory chip, allowing an NFC phone to be used to read from and write to the device. The company has also published the source code so developers can see what is involved. 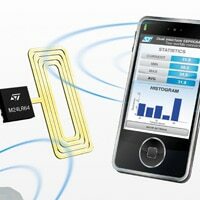 “ST’s M24LR64 wireless memory has the unique ability to transmit and receive information from the heart of an application to a smartphone containing NFC technology or to an industrial RFID reader, allowing for transactions, data exchange, object identification and tracking to occur rapidly,” the company explains. “The M24LR64 wireless memory is a device that can be accessed remotely [with read and write capabilities] by either an ISO 15693 capable NFC smartphone, or by any RFID reader supporting the ISO 15693 protocol,” ST’s Sylvain Fidelis told NFC World. The Dual EE app connects an NFC phone to a prototype temperature recorder featuring ST’s M24LR64 wireless memory and demonstrates both data transfer and storage functions. The Dual EE app is available to download free of charge from Android market. The source code and developer kits are available via ST’s website, allowing customers to use the prototype application as a base from which to develop their own applications. “Together, the dual-interface EEPROM and Android app provide a launch pad for consumer-tech innovations offering users new types of benefits via NFC,” says ST.
Can the phone act like a M24LR64 tag? To provide services to those who has a telephone is easy, but in most systems the developer can´t require that the user has to buy a smartphone. An alternative inexpensive identification method is required. It would be nice it one system could solve both problems. Advanced interface for mobile phone users and a cheap inexpensive interface for the sporadic user, ie tourists. ISO-15693 is part of NFCIP-2 or ISO-21481, which virtually means 2nd generation of NFC. In other words, in theory, the NFC phone like Nexus S should be able to act like a M24LR64 tag if it follows strictly to ISO-15693 standard – of course with an appropriate Android App. Thanks for letting us know the difficulty of service providers. Yeah, it is really not possible to ask users to have a NFC phone. Just curious, is it possible to ask users to stick a tag onto their non-NFC phone? How will most end customers react? Within acceptance?